Of course, with the music versus the backstory debate, the music should always come out on top, but things fit into place better when both complement each other to perfection. 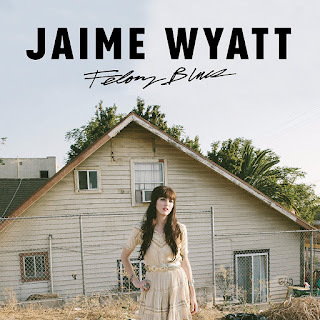 Therefore, primarily FELONY BLUES by Jaime Wyatt is an exceptionally good mini album. The phrase ‘such swagger’ is borrowed on this occasion, with the biggest fault only being: why stop at seven tracks. There is probably a practical answer to that question, but it is a tribute to the architects that you are left aching for more after an exhilarating half an hour. The enamoured sound of Jaime is based on the smart ability to unite country music with its near cousins, the alt variety and Americana, and spin it into a bunch of half a dozen highly palatable songs ready made for the sweet ear. The backstory is a little more downbeat as much of the record is based on Jaime’s experience on the wrong side of the prison walls after an addiction-fuelled altercation. Whilst not being the first country artist to channel rehabilitation into first class music, this whole scenario can prove to be additional selling point. Not that this is necessarily needed, as those who solely base their judgement on unfiltered listening will certainly be won over. Jaime’s Californian heritage, base and influence can be factored into the interpretation of her music. Naturally, it falls on the fault lines of distinctly retro and delicately contemporary. A cool freshness aids a torpedo effect into modern country fans preferring an independent edgy approach, while timeless qualities help span the generations. Also a cover of ‘Misery and Gin’, initially recorded by Merle Haggard, further pushes up the credibility in some quarters, although this track tends to crown the record rather than prop it up. The swirling guitar, lovely beat breaks and rousing chorus of opening track ‘Wishing Well’ go a long way to defining the record and it is hard to think of a stronger track that opens an album in 2017. Those who base a lot of credence on the first song setting the tone will be delighted with this offering and duly rewarded with pursuing the remainder of the content. The follow on track ‘Your Loving Saves Me’ is not short on sass or exquisite twang and yet another chorus that has little difficulty in finding a hook in your mind. By the time, we get to the delectable ‘From Outer Space’ when the steel kicks in, the implicit narrative fizzles with heartfelt pleas to a lover. Maybe this is a track that has to fight hard to be heard alongside its compatriot juggernauts, but the strength of an album is often defined by its base and FELONY BLUES has a very strong one. We get into the serious side of Jaime’s writing by the time the fiddle inspired ‘Wasco’ explodes in the listener’s midst. It is assumed this is the institution that she spent time in and the lyrics fire off in several directions while reflecting a great deal of conflicting emotions. It also puts a completely different slant on the term graduation day. ‘Giving Back the Best of Me’ is a tenderer offering utilising the steel well as Jaime slips into a poignant gear while in ballad mode. Another valid reason to extol the virtues of this being a neatly balanced collection of tunes, appealing to several sides of a listener’s preference. ‘Stone Hotel’ is the penultimate track before the Haggard cover pulls the shutter down and is another successful attempt to dress a serious point in a tune that blossoms so well upon first listen. FELONY BLUES is an album designed to make an instant impact without a layer of throwaway packaging. It presents Jaime Wyatt as a country artist to place on your 'get to know' list and one you won't regret liaising with. A sentiment launched into cyberspace by Rolling Stone’s anointment of her as a “New Country Artist You Need To Know”. You may ask what do they know, but in this instance, they are spot on.